USS Willow in Benalmadena Marine has sunk in bad weather. The USS Willow was built in 1924 by Duduque and Boiler works construction. The United States Lighthouse Service approved the construction for a Mississippi steam boat. The vessel was built just outside St. Louis at the cost of 372,000 US dollars. The Mississippi is known for being very shallow in places so the vessel was built needing to only draw 9 feet of water. The Willow is 200 feet long and 64 feet wide. When the boat was completed it under went trails on lake keokuk in Iowa. The vessel then proceeded to New Orleans where the boat received its name Willow. The US Lighthouse service took charge of her on 4th October 1927. The 15th US Lighthouse service was in the district of Memphis and the Willow was assigned to them for navigation along the Mississippi between New Orleans and St. Louis. The willows movements were restricted in the shallow waters of the Mississippi to such an extent that it had to have a 38 foot support vessel to get to places that the Willow couldn’t. The Willow was regarded by people who, didn’t know that it was a working vessel, thought it was a privately owned paddle steamer because of its beautiful looks. In 1939 the Coast Guard merged with the Lighthouse Service and the boat carried on in its role throughout the Second World War. In 1944 the Willow was badly damaged in a collision with the vessel USS LST 841. The Willow was reported to be too costly to repair and decommissioned in March 1945. After decommissioning her running gear was removed and turned into a moored boat to sleep and accommodate soldiers of the US army corps of engineers and German prisoners of war. . 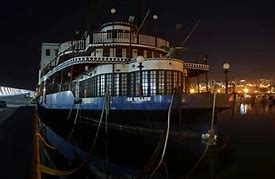 In 1962 a Kentucky business man purchased the Willow on the idea of transforming it into a floating restaurant but this never happened. The Willow remained at the port of Paducah until 1965 when it was sold to WS Young construction company. That year it was towed by 2 tug boats to La Palace, Louisiana. Whilst moored at Louisiana the Willow was hit by hurricane Betsy in 1965 and washed up onto the quay. After the devastation of hurricane Betsy the Willow sat on the quay side and was vandalized. The US Marshals department eventually took control of the vessel and sold it at auction in 1970 to a relative of the owners of Young Construction. The same year the Willow was sold on to a company called Belezian Industries. This was bought purely to be repaired and sold on as quickly as possible. Belezian Industries moved the Willow to Florida for refurbishment into a lobster factory as they had a potential buyer who was an owner of a lobster company in British Honduras. After 18,000 dollars of work the deal collapsed. Eventually a British company called Themes International purchased the Willow in 1970. Information is pretty vague on the Willow from 1970 to 1989 but it is thought that Themes International rented the vessel to a company who turned her into a floating restaurant on the river Thames in London. After many unsuccessful leases to different restauranteurs the Willow was taken to Antwerp, Belgium for a refurb. Whilst the Willow was in Belgium Themes International went out of business. The Willow stayed in Antwerp, Belgium until 1995 when its was bought again and transferred back to Birkenhead, England. It was from there it made its last sea bound journey escorted by 2 tug boats to the Spanish marina of Benalmádena. The Willow was brought by the best friend of the late Dougie Flood (whose name will stay Anonymous) night club owner in Manchester and allegedly a member of the notorious “quality street gang” who were said to run Manchester’s crime scene in the 60s, 70s and 80s. The new owner with great connections on the Costa Del Sol was allegedly told by the then mayor that he would be granted a license to use the Willow as a casino. When the Willow first arrived in Benalmadena marina it was moored in a different place as we know it today. The Willow had the most prominent location looking over bars, we now know as today, Mombasa, sushi grill Japonas, Kume and Monet. It first opened as a bar restaurant and had great success but it was never granted a gambling license as promised by the mayor. The Willow was doing extremely well and taking a lot of clients from the Spanish owned land bars in the marina. It comes as no surprise that the Spanish owners complained to the mayor and Town hall. At first the mayor didn’t take much notice but when all the owners of bars and restaurants in the marina withheld their council taxes and rubbish payments to the town hall the mayor was forced to do something quickly. To appease all the bar and restaurant owners he told the owner of the Willow he had to move the vessel to the position it is in now. He allegedly told the Willow owner it was only a temporary mooring. The Willow moved to the other side of Benalmadena marina completely out of the way of the bars and restaurants it was a ffecting. The willows success soon floundered by being out of the way and a long walk from the rest of the bustling night life of the marina. 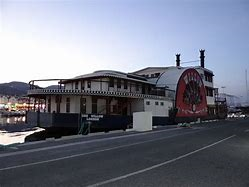 After a short time it closed as a bar restaurant and opened as a tourist attraction and a venue for private parties and weddings but this again failed to take off and it closed its doors to all in 1997. I meet the owner of the Willow in 2004 in Benalmadena marina. I explain to him I had a restauranteur that was interested in buying a floating vessel to turn into a Chinese restaurant in canary wharf in London. I asked him if it was possible to take pictures of the inside of the Willow. We met again the following week with a photographer and got some great shoots of the Willow to send to my partners in England. The restauranteur was immediately interested and wished to come to Spain to view for himself. As I am from the east end of London I knew the Willow would have to gain entry to Canary wharf though a series of locks and I was not sure if it would succeed. I then contacted the Willow owner and asked for dimensions expressing my concerns about the locks to which he promptly relayed to me all the relevant information. I promptly sent all details to my partners in London and asked them to see if it would be possible to get the Willow into canary wharf though the relevant locks. A reply came back 2 days later that the Willow was to big to go though the locks. I contacted the owner to give him the bad news and that was the last dealing I had with the USS Willow. The Willow has been in the same spot for some 20 years. It was very run down, rusty and now it seems it’s succumbed to a watery grave.